Gum disease is an active infection that can spread to other areas of your body. Typically in the form of gingivitis or periodontitis, gum disease can also lead to tooth loss. Patients who suffer from conditions such as diabetes and heart issues are especially susceptible to these infections, so it is our duty at Mint Dental Care to diagnose gum disease as soon as it is noticed to prevent other health problems from occurring! Mint Dental Care offers scaling or root planing, otherwise known as a “deep cleaning” to combat gum disease. 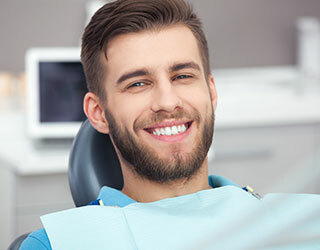 Under local anesthesia, our hygiene team will go under your gums to clean the roots of your teeth and your gum pockets where the harmful bacteria live. Through this procedure, our team can control and avoid further gum disease. When a tooth becomes severely damaged due to trauma, decay, or infection, many patients think their only option is to have the tooth removed. Root canal therapy, also known as endodontic treatment, is often the solution to save the tooth! During this procedure, Dr. Hamidi removes damaged inner tissue and refills the tooth. All infection will be removed from the tooth and the results of the procedure will not be noticeable to anyone except your dentist! Unfortunately when a tooth becomes too infected, damaged, or decayed to safely save it, extractions are sometimes inevitable. Dr. Hamidi performs tooth removal in a quick, safe, and comfortable environment. Please keep in mind that Mint Dental Care offers several tooth replacement options, including implants, removable prosthetics such as partial or complete dentures, and fixed prosthetics such as bridges. Mint Dental Care provides complete and partial dentures to help boost your confidence, reduce the risk of bone loss, improve function, and give you the smile you deserve and love! Many patients who have lost most or all of their natural teeth can restore their smiles with our custom-made complete and partial dentures. Call our office at (443) 917-6468 to schedule your consultation! “I’ve worked with Dr.Hamidi for the past year and I can say that he works with integrity, up-to-date knowledge and unparalleled clinical skills. His patients have said nothing but great things about him. I highly recommend Dr. Hamidi and Mint dental Care!” - Juheon S.